Watch the videos of this event at FFRF.org/video-2018-con and Rasel Ahmed’s interview on “Freethought Matters” at ffrf.us/ahmed. Below is an edited version of the speech given by Rasel Ahmed on Nov. 3, 2018, at FFRF’s national convention in San Francisco. He was introduced by Rafida Bonya Ahmed, who was introduced by FFRF Co-President Annie Laurie Gaylor. Annie Laurie Gaylor: Many of you will remember Rafida Bonya Ahmed, known as “Bonya,” who received FFRF’s Forward Award in 2016. Bonya was born in Bangladesh and is an American citizen. 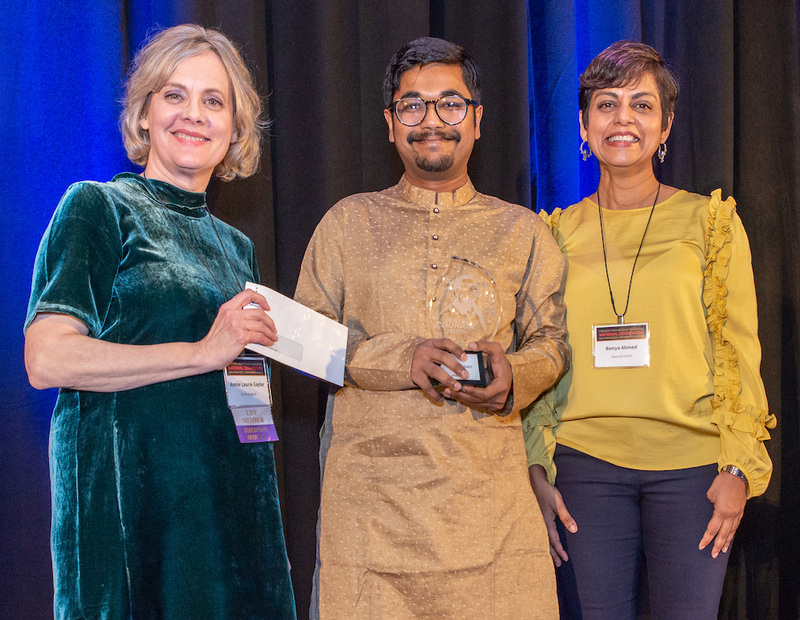 I’m pleased to announce that FFRF and Bonya are undertaking a memorial award in honor and memory of Avijit Roy, Bonya’s late husband, also an American citizen and well-known atheist and writer. Both Bonya and Avijit were set upon by machete-wielding Islamist terrorists in Bangladesh on Feb. 26, 2015, which left Avijit dead and Bonya critically wounded. The Avijit Roy Courage Award includes $5,000 and an award, whose image was fittingly designed by a graphic artist known as Sobak, a Bangladeshi freethinker himself in hiding, awaiting a chance to migrate to a Western nation. Rasel Ahmed declined the monetary prize for himself, but said it would go to further Roopbaan’s digital presence. Bonya recently gave a TED Talk in Exeter, United Kingdom. Please welcome Rafida Bonya Ahmed, who will introduce our guest speaker. Rafida Bonya Ahmed: Rasel Ahmed is a gay Bangladeshi writer, visual artist and community organizer. The Bangladeshi penal code criminalizes consensual homosexual acts, with up to life in prison, dating back to a provision imposed by 19th-century British colonial authorities. Rasel is the editor and co-founder of Bangladesh’s first and only LGBT magazine, Roopbaan. The grand launch in the capital Dhaka was attended by more than 130 allies and community members. This event was extensively covered by more than 300 local and international media outlets and the news of the magazine became viral on social media. Roopbaan magazine and LGBT issues in Bangladesh became a major topic of debate in offices, colleges and homes. After Xulhaz Mannan, co-founder and publisher of Roopbaan, was hacked to death, along with gay actor Mahbub Rabbi Tonoy, in Dhaka in 2016, many of the already marginalized Bangladeshi’s LGBT community went into hiding. The attack was claimed by the regional arm of al-Qaeda. As a filmmaker, Rasel Ahmed has used his debut documentary film, “Roopbaan,” as a conversation starter on gender and sexuality issues in Bangladesh. He supervised a group of artists to produce the country’s first Muslim lesbian comic character in 2015. Besides making independent documentaries, he has designed campaigns, directed theater performances, hosted film screenings, edited magazine and blogs, curated photo exhibitions and facilitated training. He is also actively working to promote democratic spaces and diverse voices in the Bangladeshi public square. As he feared persecution in Bangladesh, he filed for political asylum in the United States on Jan. 5, 2018, and he has received help from Nonbelief Relief. Let’s welcome Rasel to the stage. This is the largest crowd I have ever addressed in my entire life. I’m so nervous. This is wonderful. Please bear with me as I may say things that might not make any sense because this is my second language. I will try to explain my journey, and the story of Roopbaan, because I primarily identify myself as an independent, queer storyteller. The thing I feel most comfortable with is sharing stories. I will share two stories. The first is a folk story. It’s very popular in Bangladesh, which is a Muslim-majority South Asian country near India. The other one is a real story, so starting off my remarks with the first story will eventually explain how these stories got intertwined. The one I will begin with is the name of the magazine, Roopbaan. Many years ago in Nirashbu, which is the fictional kingdom in the story, there was a young girl named Roopbaan. And when she turned 12, on that very day, she was forced to marry a 12-day-old prince. She was forced after the marriage to leave the kingdom, so she was practically exiled to a jungle for 12 years. The reason behind that was to save the life of Roopbaan’s infant husband. This story has evolved over 800 years in mostly the eastern part of Bengal, which is now known as Bangladesh. It has become Bangladesh in the last 50 years. I think it’s incredible that how in that part of Bengal, which is the Muslim-dominated part of Bengal, a story like this evolved. Later, I realized the reason people celebrated it was because their story was mostly narrated by heterosexual men. And the story has served as a kind of erotica or fantasy for heterosexual men for a long time. Muslim heterosexual men, to be precise. So why did a group of queer people name a queer magazine, a gay magazine, an LGBT magazine, after this character? A group of queer men in Dhaka, which is the capital of Bangladesh, decided to reclaim the story. They took this very heterosexist, flawed and problematic story and retold it from a queer perspective, shifting the focus from heterosexism to feminism. And how did we do that? We came up with our twist of the story. This is a love story of a woman who is 12 years older than her husband, which is not the case in real world, in real Bangladesh. The main protagonist of the story is a woman. In Bangla, I don’t think there are many references to a woman as the leading character of a folk story. What we wanted to tell them is that it’s essentially a story of a woman and her 12 years of struggle to do pushback — to push back sexism, to push back unwanted sexual moves, to push back repression. Eventually, it’s a story of the triumph of love over social stigma and oppression. So that was the twist that we came up with when we launched the magazine in 2014. We started working on the magazine at the end of 2013, and it took more than a year to come up with a 54-page magazine. Oh, my god. The community went mad, especially the heterosexual men. I think there are a couple of reasons for that. They were mad because gay people, for the first time, said it was OK to be gay. We are gay and we’re acknowledging our gay identity, so they couldn’t take that. And the second reason was, basically, how dare gay people touch their heterosexual erotica. They were super mad. Then it turned political, so Roopbaan became news in the country and internationally. After we came up with the magazine, we realized it was very internationally sellable news. It was picked up by many international and national news outlets. What made me very scared was that my name and picture were in the magazine. And when this news started circulating, I panicked a lot. So that was sort of the starting of our journey of becoming more visible in that country, which is about 90 percent Muslim. I don’t think that’s the only reason why we couldn’t come out. I think religion definitely is one reason, but there are so many other different social challenges. Patriarchy was a challenge, and how we look at the spectrum of sexuality. In Bangladesh, the discourse is missing talk about gender and sexuality. It’s a lack of knowledge, lack of information. The thing I often say is that homophobia in Bangladesh is not proper homophobia because they don’t know what it is. It’s lack of knowledge. I think it was one of the dominant reasons why we were targeted, especially online. And social media was also booming in late 2014, so people suddenly knew about us. They started making comments on every other post they see. And we were very scared because we were not expecting something this big could happen after the launch of the magazine. Now, I want to introduce a character from the real story. His name is Xulhaz Mannan. Xulhaz was basically a cat lover and a traveler. If any one of you would know Xulhaz, you would have probably received at least one travel request from any random place‚ like a six-day trek in Rukum, which is in India, or bungee jumping in Nepal, or rafting in Sangu, which is one of the roughest rivers in Bangladesh. He was a man with so many different and beautiful ideas. He loved organizing. And he was the one who came up with this idea of this magazine and planted this idea in my mind because, duh, I was very naive. I was very easily convinced by him that I had to do something at the age of 24. I was convinced that we have to save the gay community in Bangladesh by writing their stories. So, we came up with this magazine. But what followed after that, it wasn’t all bad, but it was up and down, to be very honest. We were targeted, we were bullied, we were threatened, but at the same time we were appreciated. We were also encouraged when we came up with this magazine by many of our allies and supporters. Before the magazine, Avijit Roy’s book Shomokamita was published in 2010. We know that because the book is written about us. It was so important because before this book, even to write the magazine in Bangla, we did not have the language of sexuality. So how do you express who you are when you don’t have the language? What do you do? Duh, you borrow it from the West. You start calling yourself gay, lesbian and all of those things. But we have other identities beyond this, beyond the Western spectrum of gender and sexuality. So when Avijit Roy came up with this book, it gave us a lot of hope, and let people know that it is not a crime to be who you are. This is not a disease, which has been told by the heterosexual community for many years. So that book, even before the magazine, was something we could always refer to. When we were brainstorming for the magazine, we wanted to connect with Avijit Roy. I knew of him because of his work and because of his image as a public writer, but personally I never knew Avijit Roy. When we wanted to do the magazine, we thought to connect, and he generously agreed to be interviewed by us. We did the interview during our first issue, but it was at the last moment, so we couldn’t publish it in the first issue. But we became allies. One of the plusses of coming up with the literary magazine is that you meet other people who you didn’t know before. Avijit Roy was there, and then we got connected — our gay community and the people who wanted to work together. When that attack on Avijit Roy happened in 2015, it was not only an attack on him, but it was an attack on our entire community. The community, and I’m talking about the queer community in Bangladesh, the queer community felt the attack. We felt it. We felt threatened and we felt like other than the personal loss and mourning and outrage, what the attack evoked was also the fear. And for the first time, I think the fear was real. We always knew that we were doing something very controversial and sensitive in Bangladesh, but I don’t think any of us thought that we would be targeted like this. After that, we were very terrified. And by we, I mean the queer community. It was again very difficult to go back into the closet because, by then, we started organizing. Other than the magazine, we started doing rallies, we did a transgender fashion show, we came up with a poetry book, we did comedy nights. And after Avijit Roy’s murder, every month it seemed there would be someone murdered from the blogger, activist, secular community. So that was indeed very scary. And eventually we were scared of becoming the target. That became true in April 2016, one year after the murder of Avijit Roy. Xulhaz Mannan, my friend, the character I introduced, was in his house and having a discussion with one of his friends, who was also a Roopbaan activist. They were just chit-chatting and his doorbell rang. There were four men posing as couriers who went up to Xulhaz’s apparently very secured apartment. Because they were posing as couriers, no one could tell they were armed with machetes. They forcefully opened the door and murdered both of them — hacked to death. That opened the window of fear and many people left the country after that, including myself. I think we are the people carrying the baggage of this murder the most because the journey did not end. We are still in a very transitional phase and so is Roopbaan. Even the government of Bangladesh condemned the bloggers and the homosexual people for coming up with a gay magazine. It said this doesn’t go with the culture of Bangladesh to write about sexuality. One final thing I’d like to say. After coming to this country, a lot of people mentioned that this is a safe haven. It’s great for you and they congratulate me, but we have to go deeper into this concept of safety and think more about it because it’s not all about physical safety. It’s also about mental security, it’s also about emotional safety and identity and belongingness. And coming to this country under this administration, under this Trump administration, it feels no less horrible than being in Bangladesh. It’s seriously a terrible time to be here for any immigrant. I think we are all fighting for the same reason. We are all speaking the same language — freedom of speech and freedom of association for marginalized people in a country where dissenting voices are always crushed. I would like to end my remarks by thanking Bonya. Bonya, thank you so much for considering Roopbaan for this award and thank you, Freedom From Religion Foundation, for considering us. Thank you very much for this award and for this recognition.